The 10 Best Places for Milkshakes in Kentucky! From burgers and fries to international cuisine, a milkshake is a great drink to accompany your favorite food. Whether you like traditional flavors like vanilla, chocolate, and strawberry or opt for something more unique, you’ll find a great range of combinations at the 10 best places for milkshakes in Kentucky! Broomwagon Bikes & Coffee is one of the most unusual venues in Lexington, Kentucky. Known as a great place to get repairs done on your bike, you can also shop for accessories and riding-related equipment and supplies, feast on tasty snacks like wraps and burritos, and grab a hot coffee or creamy milkshake. Known as a full-service shop, Broomwagon carries brands like Haro BMX and MTB for riders of all ages, and offers a dine-in, take-out, and delivery menu options. Open Monday through Friday, they have weekly specials and amazing custom-made milkshakes. What more could you want? Did you know that it’s helpful to attend an Ice Cream School when you’re contemplating opening an ice cream shop? That’s exactly what the owners of The Comfy Cow did and opened their doors in 2009. The result of this dedication to learning is a premiere ice cream eatery that serves some of the best ice cream treats around. With milkshake flavors like bourbon pecan pie, chocolate peanut butter cup, blueberry cheesecake, and raspberry lemon sorbet, every delicious refreshment is made from the best ingredients and will satisfy your taste for a cool creamy dessert any time of the year. A trip to Louisville, Kentucky, would not be complete without stopping by Graeter’s Ice Cream. This popular icon of the area has over 145 years of experience serving the best ice cream products in the state. Not just because they’re the experts on serving the best ice cream around, their passion for excellent customer service has earned them numerous awards and popularity on social media sites. You can buy their ice cream in selected grocery stores, and order online for delivery right to your doorstep. And if you check their website, they offer a $5 coupon off your first visit. If you’re looking for a place in the Lexington area that serves authentic and delicious Cuban food, look no further than Old San Juan. Don’t let the outside keep you away from this eatery because inside you’ll find some of the best sandwiches around town. With prices that won’t break your wallet and friendly folks, you’ll see that this is not your typical diner. They’ll also been voted one of the best places to go for milkshakes, and have flavors like guava, mango, papaya, and guanabana, you can’t go wrong! Good coffee isn’t the only thing you can find at Etcetera Coffeehouse in Paducah, Kentucky. Open since 2006, this casual coffee shop features some out of this world milkshakes and smoothies made with fresh fruit and other ingredients. 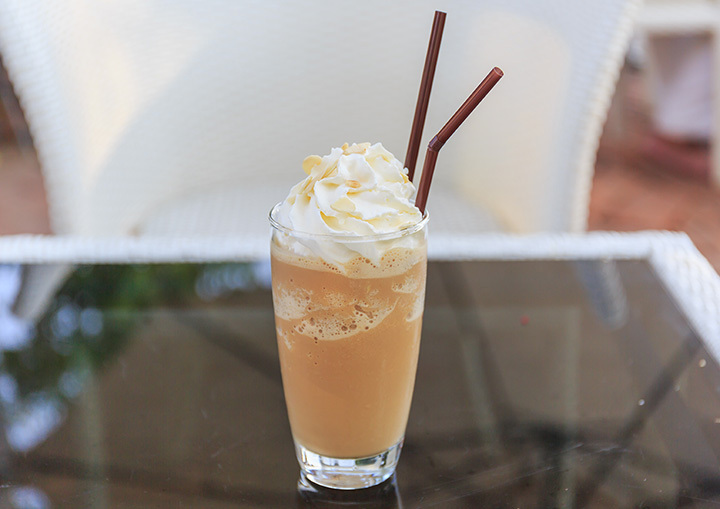 If you want a special treat, try the banana espresso milkshake. If you stop by often, you’ll get a card that’s stamped at each visit and earn free goodies. While you’re there, you can enjoy the artwork that’s displayed by local students and artists that change monthly. What’s red and white and full of creamy deliciousness? Cliffside Diner in Frankfort, Kentucky! Open for breakfast, lunch, and dinner since 1948, you’ll get traditional favorites like meatloaf, roast beef and mashed potatoes, and cheeseburgers fixed your way. And what better to enjoy with your food than a cold Creamsicle milkshake? Very inexpensive, you could easily feed a family of four for less than $30. You’ll feel like you stepped back in time when you see the black and white tile floor and red tables and chairs. You’ve heard of fast food, but you’ll find “fun” food at Piper’s Café in Covington, Kentucky. This amazing little diner will take you by surprise with an eclectic menu that changes with the seasons and includes traditional hot dogs and hamburgers, but has healthier alternatives like their fresh fruit and vegetables salads. They use the patented Sodastream method for all their sodas that help decrease the amount of sodium and sugar but leave all the flavor. And for milkshake lovers, they have 63 lactose-free flavors of ice cream that can be made into your favorite flavor combination. They have limited seating inside, but a nice garden area outside. If you want a thick creamy milkshake that defies expectations, drive down to Belew’s Dairy Bar in Aurora. Open every day except Tuesday, Belew’s is a great example of an old-fashioned drive-in from yesteryear. This family friendly establishment serves all your favorite food like burgers, hot dogs, French fries, onion rings, and much more. For your sweet tooth, you can get a sundae, banana split, or cone, and to wash down your meal, they have vanilla, chocolate, strawberry, butterscotch, cherry, and pineapple milkshakes. A landmark for good service and great food since 1954, Big Dipper in Owensboro, Kentucky, also known by the locals as “the Dipper,” should definitely be on your list of places to visit. With traditional food like burgers and fries, sodas, and ice cream, this is not fast food. Lines can be long, but the wait is worth it. They don’t have an inside dining area, but there are several picnic tables nearby and you can drive-through to place your order. You have to try the Pig, a fried bologna sandwich, or the famous chili made from a secret recipe in a 50-gallon container that’s’ been made the same way for years. And if you love milkshakes, you can get those here, too. A local icon that’s been serving great ice cream treats and sandwiches in the Louisville, Kentucky area is Dairy Kastle. For over 40 years, Dairy Kastle has served ice cream cones, sundaes, foods like hot dogs with toppings like sauerkraut, chili, cheese, slaw, and beans, and amazing milkshakes. You’ll have a hard time choosing what flavor from the extensive list that includes peanut butter, peach, blueberry, banana, cappuccino, cherry cordial, mint chocolate chip, and traditional favorites like strawberry, chocolate, and vanilla. Eating here is more than just satisfying your appetite. It’s an experience.